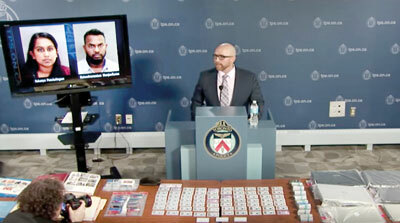 Two Sri Lankans have been arrested as part of an investigation by Canadian police into a multimillion dollar fraud and money laundering operation. Sukanya Panchalingam and Balasubramaniam Shajeefkaran, a husband-and-wife pair between the ages 28 and 36, were taken from a home in Ajax, Ontario, where Toronto police found more than CAD (Canadian dollars) eight million worth of fraudulent cheques and stolen merchandise. The investigation was led by Constable Michael Lane whose press conference on “Project Fellowship”–as it is called–was accessed online by the Sunday Times. The Toronto police confirmed both were Sri Lankans but refused to divulge their immigration status. The arrest of the couple is believed to be the tip of an investigation that is expected to reel in more members of the fraud and money laundering ring. Police are urging potential victims to come forward. The case started around the end of June 2016 on a complaint from a franchise businessman that a woman had deposited a dud cheque into his business, Constable Lane told media. “From there, we continued with our investigation which revealed there were many other victims,” he said. Multiple hundreds of dud cheques were deposited into people’s personal and business accounts with the suspects and others involved getting away with the funds. Separately, counterfeit or synthetic fake identification was used to open up business and personal accounts, get credit products, loans and anything in relation to obtaining funds. Those monies were used to buy high end vehicles like Mercedes, Land Rovers and BMWs, and heavy equipment. Phone numbers were also created for each business and for each person so that, if the financial institutions did call, there was an actual number associated to it. “Part of the investigation has revealed that it’s well over CAD 8 million that has been lost and laundered,” Constable Lane said. Police have taken into custody a large number of documents. Mr Balasubramaniam is charged with fraud over CAD5000; possession of proceeds obtained by crime over CAD5000; laundering proceeds obtained by crime; unauthorised possession of counterfeit mark; and conspiracy to commit indictable offence. His wife is charged with fraud over CAD5000, possession of proceeds obtained by crime over CAD5000; and laundering proceeds obtained by crime. Part of the probe is to determine how the various identifications were created, he explained, with a huge haul of fake IDs lined up on a table before him. Constable Lane could not say whether all of the money could be recovered but said assets, including vehicles, have been seized and some of the funds obtained. As part of the scam, the couple–and possibly others–created fake businesses and went to financial institutions claiming to work for them. 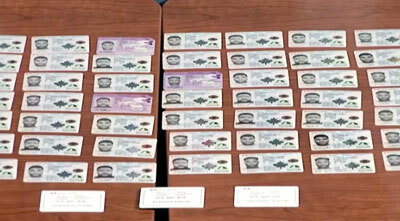 They also provided forged pay stubs and, with that information, were able to obtain vehicles. Some of these were being shipped out to Quebec and were located in containers as well as at auctions within the province. Victims of the crime include corporations and individuals. “Whatever they were able to obtain through their scheme, they were able to take and launder the proceeds of that,” Constable Lane said. He also had in front of him account opening documents, computers seized from the place of residence, cellular phones alleged to have been used as part of the scheme and cheques. It is alleged that Ms Panchalingam had worked at a bank as a fraud officer but this is still under investigation. “All financial institutions have been cooperative with relation to this because it is a large financial loss to everybody,” the police officer said, adding that he did not immediately know what the occupation of the male suspect was. Constable Lane revealed that 12 other people have been arrested and charged under Project Fellowship but did not offer details. Some of them were Canadian citizens and permanent residents.